The more powerful our devices become, the more heat they generate. In fact, certain bleeding edge electronics are so reliant on cooling that they would stop working without it. To continue to produce more powerful electronics, there needs to be a significant advance in how we keep them cool. And, we’re running out of practical cooling solutions needed to develop next-generation electronic devices. 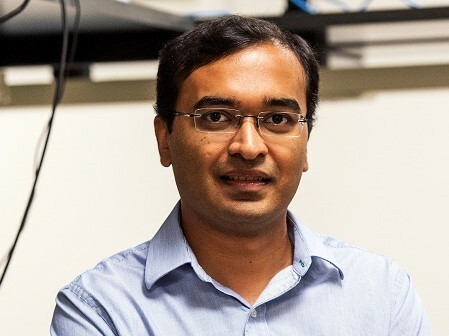 This summer, Associate Professor Shalabh Maroo in the College of Engineering and Computer Science received a $500,000 grant from Office of Naval Research to conduct new research on exactly that. In this work, the size of a processor’s surface area becomes very important. Certain powerful new processors generate as much as 10 watts of heat per square-centimeter of area. That may seem small, but it is a big deal by comparison. A clothes iron generates just 5 watts of heat per square-centimeter of area and reaches a surface temperature of over 400 degrees Fahrenheit. Further, very localized spots in the processor can even generate heat over 100 or 1,000 watts per square-centimeter of area. Plus, we want to make our processors smaller and smaller. Removing 10 or 100 or 1,000 watts of heat from a square-centimeter of area is far more challenging than removing the same amount of heat from a square-meter of area. Advancements in cooling techniques are thus essential. A. Our research aims to understand and develop a thermal technology which can provide cooling of more than 1,000 watts per square-centimeter of area while also keeping the device’s temperature within an operational range. The fundamental research aims to investigate phase change heat transfer in liquid-filled small-sized micro/nano channels using experiments, molecular dynamics simulations, and continuum simulations. Such a cooling technology could possibly assist in the development of terahertz processors which could be 1,000 times faster than the current gigahertz processors.